Biocon, India's largest biotech company which has focused on delivering affordable innovation. Biocon is India's largest biotech company which has focused on delivering affordable innovation. Kiran Mazumdar-Shaw, is the Chairman and Managing Director of Biocon. The Organisation is committed to reduce therapy costs of chronic diseases like diabetes, cancer and autoimmune diseases by leveraging India's cost advantage to deliver affordable healthcare solutions to patients, partners and healthcare systems across the globe. Biocon's key innovations include world's first Pichia based recombinant human Insulin, INSUGEN®, insulin analogue Glargine, BASALOG® and India's first indigenously produced monoclonal antibody BioMAb-EGFR®, for head and neck cancer. INSUPen® is a next generation affordable insulin delivery device introduced in India by Biocon. Its aspiration is to become a US $ 1 billion company by FY 18 is fuelled by five powerful growth accelerators, Small Molecules, Biosimilars, Branded Formulations, Novel Molecules, and Research Services with a focus on emerging markets. Over the decades, Biocon has successfully evolved into an emerging global biopharma enterprise, serving its partners and customers in over 75 countries. As a fully integrated biopharma company it delivers innovative biopharmaceutical solutions, ranging from discovery to development and commercialization, leveraging the cutting edge science, cost-effective drug development capabilities and global scale manufacturing capacities, to move ideas to market. Leveraging India's globally competitive cost base and exceptional scientific talent, the Company is advancing its in-house R&D programs, and is also providing integrated research services to leading global pharmaceutical and biotechnology companies through Syngene and Clinigene. Biocon has rapidly developed a robust novel and biosimilars pipeline, focusing on Diabetes, Oncology and auto-immune diseases, which has several molecules at different stages of the development cycle. With the successful commercial launch of its first anti-cancer drug and several promising discovery partnerships in the clinic, the Company remains committed to scaling new heights in frontier science and achieving new milestones in affordable medicine. To navigate the challenges of innovation in the next decade, the company has adopted a well-defined strategic framework that will transform scientific discoveries into advances in human healthcare and generate incremental value for organizations shareholders. The Innovation Matrix is mostly the four-dimensional endeavour which extends into the realms of the known and the unknown. Creativity in the known realm builds on existing knowledge and can result in two types of innovation: INCREMENTAL and EVOLUTIONARY. Creativity that challenges unknown boundaries and creates new knowledge is EXPERIMENTAL and TRANSFORMATIONAL in its impact. A portfolio that covers all four spheres enables Biocon to sustain innovation in the short, medium and long term. The biosimilar insulin, an outcome of incremental innovation, is one of the world's most affordable therapies for insulin dependent diabetes. Bio-generic monoclonal antibodies form the core of organization evolutionary innovation strategy. In the more challenging area of experimental innovation, Biocon is at the cutting edge. The organization is developing conjugated antibodies to potentially deliver therapeutic cancer vaccines. It is also pursuing a path of breakthrough innovation through global phase II human clinical trials to develop the world's first Oral Insulin. Biocon is constantly traversing the path of delivering affordable therapeutics to the patients worldwide. Biocon's Founding Day was the start of a biorevolution in India. Over the years, Biocon has evolved as an enzyme-manufacturing company into a fully integrated biopharmaceutical enterprise. Today, the company leverages a formidable combination of proprietary fermentation technologies and research skills to develop affordable therapy for unmet medical needs. In the year 1989 Unilever plc. acquires Biocon Biochemicals Ltd. in Ireland and merges it with its subsidiary, Quest International. Biocon is the first Indian biotech company to receive US funding for proprietary technologies. During the year 1990 Biocon scales up its in-house research programme, based on a proprietary solid substrate fermentation technology, from pilot to plant level. In the year 1993 Biocon's R&D and the manufacturing facilities received ISO 9001 certification from RWTUV, Germany. in the year 1994 Biocon established Syngene International Pvt. Ltd. as a Custom research Company (CRC) to address the growing need for outsourced R&D in the pharmaceutical sector. In the year 1996 the commercial success of Biocon's proprietary fermentation plant leads to a 3-fold expansion. In the year 1997 Biocon spearheads the initiatives in human healthcare through a dedicated manufacturing facility. In the year 1998 Unilever inked a deal with ICI to sell its specialty chemicals division of which Quest International is a part. Unilever agrees to sell its shareholding in Biocon to the Indian promoters. Biocon becomes an independent entity. In the year 2000 Biocon commissions its first fully automated submerged fermentation plant to produce specialty pharmaceuticals. Biocon establishesdClinigene, India's first Clinical Research Organisation (CRO) to pursue clinical research and development.In the year 2001 Biocon became the first Indian company to be approved by US FDA for the manufacture of lovastatin, a cholesterol-lowering molecule. Biocon's proprietary bioreactor, PlaFractor™ is granted a US 2001 and world-wide patent . In the year 2002 Clinigene's clinical laboratory is the first in India to receive CAP accreditation. In the year 2003 Biocon is the first company worldwide to develop human insulin on a Pichia expression system. In the year 2004 Biocon creates a buzz in the stock market in March 2004 with its hugely successful IPO. Day 1 on the bourses closes with a market value of $1.11 billion, making Biocon only the second Indian company to cross the $1 billion mark on the first day of listing. Then Biocon Limited, announced the launch of INSUGEN®, the new generation bio-insulin, manufactured in Asia's largest human insulin plant. Biocon Limited and Vaccinex, Inc. announced a broad strategic partnership to discover and co-develop at least four therapeutic antibody products. In the year 2005 Biocon signed a commercial agreement for supply of insulin API to Asia, Africa and the Middle East. In the year 2006 Biocon inaugurated Biocon Biopharmaceuticals which became India's largest multi-product Biologics facility at Biocon Park.This became India's largest integrated biotechnology hub, comprising an integrated cluster of research laboratories and manufacturing facilities spread across 90 acres in KIADB (Karnataka Industrial Areas Development Board) industrial estate. Biocon announceed a licensing agreement with Bayer HealthCare (BHC) for the exclusive marketing and trademark rights for INSUGEN® for the Chinese market. Syngene and Innate Pharmaceuticals AB, Umea, and also Sweden conclude a cooperation agreement to jointly develop, manufacture and market virulence blockers to counteract bacterial diarrhoeal disease. Biocon launches India's first anti-cancer drug BIOMAb EGFR®. In the year 2007 Biocon and Abu Dhabi based pharmaceutical company Neopharma sign an MOU to establish a JV to manufacture and market a range of biopharmaceuticals for the GCC countries (Gulf Cooperation Council). Biocon grants exclusive license to Ferozsons Laboratories Limited for marketing BIOMAb EGFR® in Pakistan. Biocon announced the launch of its Nephrology Division and a comprehensive portfolio of renal therapy products. Syngene entered into a research partnership with Bristol-Myers Squibb and completed the ground breaking ceremony of new research facility at Biocon Park. Biocon signed a Memorandum of Understanding with Deakin University, Australia to establish Deakin Research Institute in Bangalore. Biocon divested its enzymes division for USD 115 million to Novozymes. Biocon business portfolio then was to focus on biopharmaceuticals. Biocon and Abraxis BioScience, then announced an agreement wherein Abraxis will license the right to develop a biosimilar version of G-CSF (Granulocyte-Colony Stimulating Factor) in North America and the European Union. Biocon and Neopharma signed an MoU to establish Neobiocon, a joint venture company in Dubai's biotechnology and research park, Dubiotech. Biocon and Abraxis BioScience Inc., announced a licensing agreement for the commercialization of ABRAXANE® (paclitaxel protein-bound particles for injectable suspension) (albumin-bound) in India. Biocon presented the results of Phase 1 studies on its oral insulin product, IN-105 at the European Association for Study of Diabetes (EASD) meeting held at Amsterdam. In 2008 Biocon acquired a 78% stake in German pharmaceutical company, AxiCorp GmbH for a consideration of €30 Million. Biocon launched a Safety Device in the form of pre-filled syringes for two of its life saving products, GCSF (granulocyte-colony stimulating factor) and EPO (Erythropoietin) in collaboration with Safety Syringes Inc. ERYPRO Safe™ and NUFIL Safe™ are the first two drugs to be marketed using this novel device with other injectable products to follow in the future. Biocon and Abraxis Bioscience launched ABRAXANE in India for treatment of Breast Cancer. 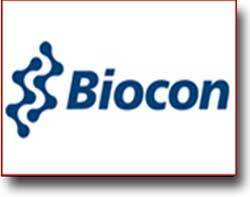 Biocon is ranked among the top 20 global biotechnology companies (Med Ad News). Biocon is the 7th largest biotech employer in the world (Med Ad News). Biocon announced the results of an ascending dose study on its oral insulin drug (IN-105) at the European Association for the Study of Diabetes (EASD) meeting in Rome. NeoBiocon and Abraxis Bioscience launched Abraxane in The UAE for the treatment of Breast Cancer. In the year 2009 Biocon's Syngene partnered with Sapient Discovery to expand integrated drug discovery offerings. Biocon's Syngene and DuPont Crop Protection Forged Alliance Partnership Bristol-Myers Squibb and Biocon's Syngene opened new R&D Facility at Biocon Park. Biocon launched BASALOG - long lasting basal insulin for Type 1 & Type 2 Diabetics. Biocon also inked partnership with ISB to launch the Biocon Cell for Innovation Management. Biocon Announced Strategic Collaboration with Mylan to enter the Global Generic Biologics Market. Biocon Limited and Amylin Pharmaceuticals entered into a Global Development and Commercialization Agreement for a Novel Peptide Hybrid. The Program is to focus on the potential treatment of diabetes. Biocon and HCG group of hospitals join hands to fight against cervical cancer. 2011 - Biocon divested its stake in its German subsidiary, AxiCorp GmbH, to the existing group of promoter shareholders; AxiCorp was the licensee for Biocon's biosimilar Insulin and Glargine in Germany and had the sole responsibility for commercializing these products. As a consequence of this divestment, these rights reverted to Biocon. Biocon launched INSUPen®, a convenient and affordable reusable insulin delivery device. 2012 - Biocon announced Positive Results from its Global Phase 3 study with Recombinant Human Insulin. GE Capital invested in Syngene, Biocon's Research Services Subsidiary. Biocon announced Positive Efficacy Data from Phase 3 clinical study with its Novel Monoclonal Antibody, Itolizumab for Psoriasis. Syngene - a subsidiary of Biocon Group, in collaboration with Abbot, setup a dedicated Nutrition Research and Development Center at Biocon Park. Biocon announced positive results from its Phase 1 Comparative PK-PD Study with Biosimilar Insulin Glargine. 2013 - Biocon received Marketing Authorization from the Drugs Controller General of India (DCGI) for its Novel Biologic Itolizumab, anti CD6 molecule, for the treatment of chronic plaque Psoriasis. Biocon enhances Partnership with Mylan through Strategic Collaboration for Insulin Products. Over the years, the organization has systematically leveraged the technology platforms from enzymes to small molecules to recombinant proteins and antibodies. Through partnerships and alliances, Biocon has strategically moved up the value chain from supplying pharmaceutical bulk actives to developing proprietary molecules and its own branded formulations. In the areas of custom and clinical research services, collaborative partnerships with complementary biotechnology and pharmaceutical companies are yielding rich results. The organization believe these partnerships will positively impact any and all phases of organizations discovery portfolio. Biocon is among a few companies in the world with a diverse scientific skill base and advanced manufacturing capabilities for the development and commercialisation of biopharmaceuticals. It offers a range of products from fermentation derived small molecules to recombinant proteins and antibodies. In the specialised field of custom bio-manufacturing, the organization provides high quality, cost-competitive services to domestic and international pharmaceutical companies.